“Moderate” Rep. Tim Ryan (D-OH) lied on Maria Bartiromo’s Sunday show yesterday that climate change will warm the Earth by 7 degrees Celsius in the next 70 years. Let’s see if Glenn Kessler or Politifact fact-checks him. Curious what power source the Green New Deal proponents say cargo ships will use for trading goods across the ocean. That’s an interesting stone. Must be a story there. My grandmother had twins that died about 1902 (?). I know where they are buried and have seen a picture of their stone. A few years later (1908) she did have twins, one was my father, and both lived. 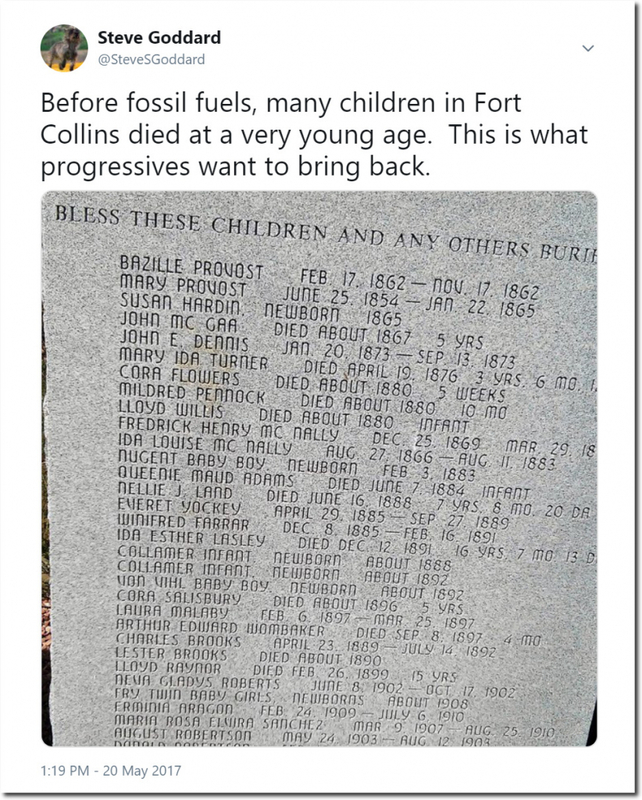 I expect the deaths back then were less to do with fossil fuels and more to do with medicine and hygiene, though I’m sure hypothermia related illnesses would be on the list of causes. There’s a boatload of crazy crap in the GND that could be torn down, like the rate at which they’d need to outfit buildings with solar, not to mention the total cost, over such a short period of time; that’s just one aspect of many. It’s probably a good thing that they’re bringing the GND out now: gives people more time to tear it to shreds before the election. So far, there does not seem to have been a lot of analytical criticism; perhaps it’s all about timing it so that it’s fresh in voters heads when they head to the polls. Petroleum is used widely in health care—primarily as a transport fuel and feedstock for pharmaceuticals, plastics, and medical supplies—and few substitutes for it are available. This dependence theoretically makes health care vulnerable to petroleum supply shifts, but this vulnerability has not been empirically assessed. We quantify key aspects of petroleum use in health care and explore historical associations between petroleum supply shocks and health care prices. These analyses confirm that petroleum products are intrinsic to modern health care and that petroleum supply shifts can affect health care prices. In anticipation of future supply contractions lasting longer than previous shifts and potentially disrupting health care delivery, we propose an adaptive management approach and outline its application to the example of emergency medical services. Without energy from hydrocarbons much of the infrastructure to achieve the hygiene to prevent disease would not have been accomplished or would have taken much much longer. It is very difficult to recover from illness when you are having to fight to stay warm. High child mortality supports the Progressive goal of reducing the planet’s population but to die as infants or toddlers the children would first have to be among the lucky newborns not killed at the birth table by the doctor. Especially if they’re black babies. Proportionally far more black babies are aborted than any other race. In NYC more black babies are aborted than born. That’s been part of Planned Parenthood’s plan from the very beginning. To the Progressives we are all just breeding stock that needs to be scientifically managed and culled. The bigger issue is that the science, and I am referring to the hard science, does not support the level of emergency that is implied by alarmists. Secondly, the hard science does not even support that any significant global warming can be attributed to atmospheric CO2. Lastly, their proposed solution to what they say is a problem is not even close to optimal, due to severe economic disruption and dislocation. What would be closer to optimal to simply fix atmospheric CO2 is the large scale planting of trees, whose woody trunks store a tremendous amount of CO2. This would also produce other social and economic benefits, not to mention the retention of soil, recycling of ground nutrients, transpiration of groundwater, and establishment of tree micro climates. I also mourn the missed opportunity to fix the planet. For a brief moment in history, Dr. Alexandria Occasional-Cortex had the perfect solution in her manifesto but then she found out she did not write it. What a bummer. The government would have planted trees, built railroad tracks to every subdivision, banned farting cows, fossil fuels and airplanes, paid people unwilling to work and created a progressive paradise all in one sweep. Now we are left alone to fend for ourselves. Science Fictional Green New Deal goes down in flames a week after its unveiling. I replied to Thomas before I read this. I reckon all three of us received the same message from Mother Earth.